The GeForce GTX 1080 Ti's only real competition right now is, wait for it, the GeForce GTX 1080 Ti. If your pockets are deep enough, and by deep we mean having at least £650 spare change, there is an abundance of choice from all partners. We've seen five interpretations come through the labs and one that is conspicuous by its absence is EVGA, who has been an Nvidia stalwart for over 15 years. 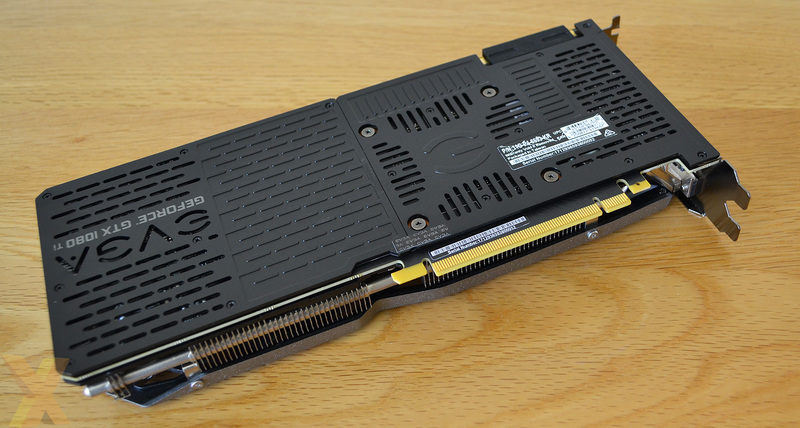 There are seven cards in the EVGA GTX 1080 Ti arsenal, ranging from $699 to $809 for an all-singing watercooled version. Slap bang in the middle is the SC2 Gaming featuring in-house-developed iCX Technology. The card's cooler is a departure from EVGA's traditional design even as recently as last year. The busy-looking shroud makes the card appear large, but at only 270mm long, it is one of the more compact Ti offerings out there, and the overall profile is helped by keeping to a strict two-slot form factor. Build quality is up to EVGA's usual high standards, and it's fair to say that the workmanship is a cut above most others. 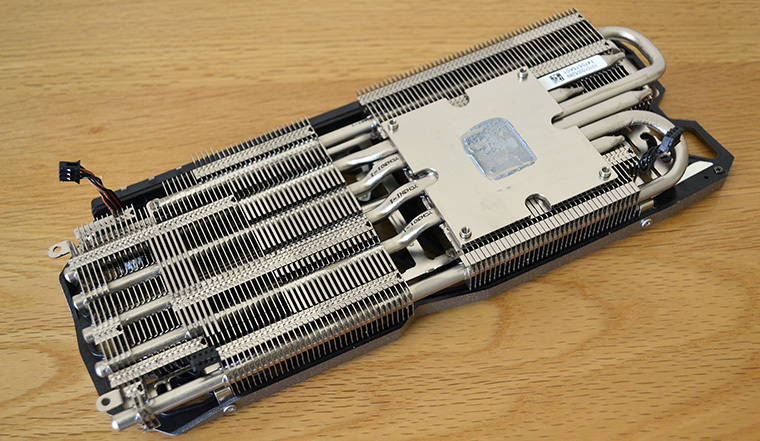 The overall design, where you can readily see the underlying heatsinks, is akin to Marmite: we happen to like it. Part of the iCX improvements rest with reducing noise by having the two large fans run at asynchronous speeds, which while seeming counter intuitive on first blush, actually works better than you'd think in previous versions. The rear has one of the more lavish cooling plates out there, perforated here and there. Fit and finish is good and it does get warm when the card is under the pump. 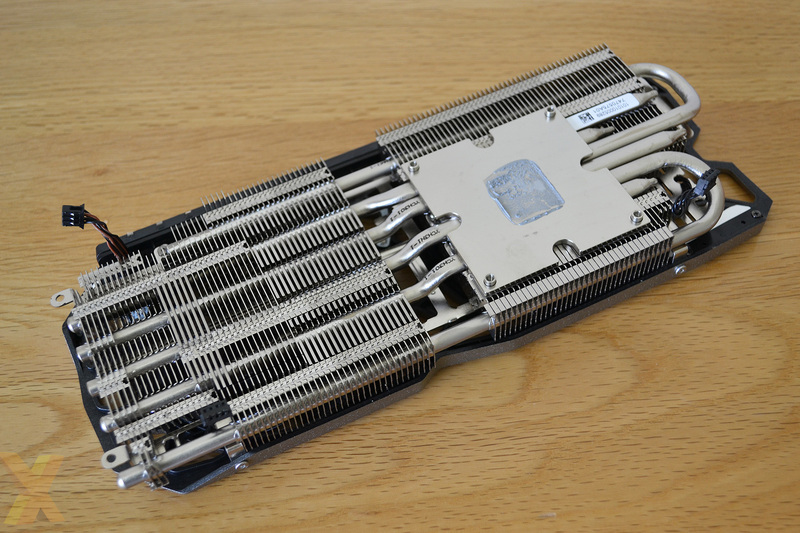 The upper heatsink, which is in contact with the core, comes away by removing a total of six screws. Industrial is the best way we'd describe this card. Five heatpipes pierce the array of aluminium fins but don't jut out past the length of the shroud. Remember that there are an additional nine sensors that log the temperature of various parts of the card, comprising six on the back and three on the front, so you have a clear idea of what's happening in each segment. 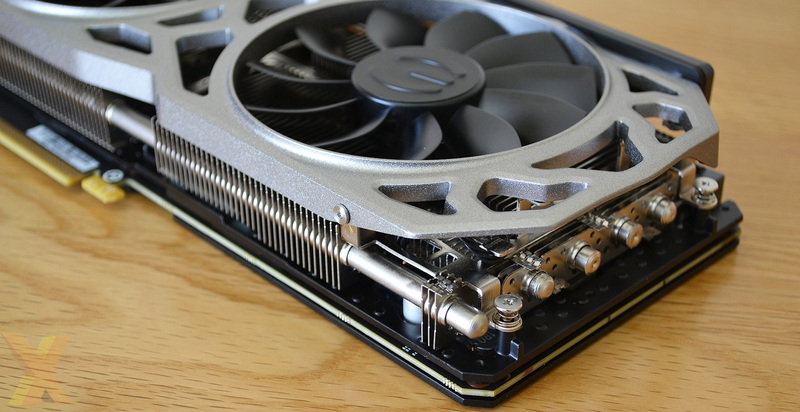 The sensors tie-in neatly with EVGA's Precision XOC software utility, through which users can monitor component temperatures and set independent fan curves. As usual, the twin fans switch off when temperature is below 60°C or so. The FTW variant has a couple of BIOSes so that enthusiasts can tinker with one and change profiles, while the SC2 Gaming keeps to just the one. You can't get to an SC2-class of card and not talk about RGB lighting. Three RGB LEDs sit just above the also-backlit logo and can be set to light up different colours depending upon load. The SC2 model insignia is no stranger to lighting, either. Power, as you can see, is sourced by a combination of an 8-pin and 6-pin power connector. Stripping away the heatsink shows that, compared to previous designs, EVGA has added in an additional heatpipe to help keep temperatures lower near the usually toasty VRMs. There's a decent amount of baseplate coverage, extended by the use of pin-fins. With all this attention to cooling it would be reasonable to assume the SC2 is clocked in highly. That's not entirely the case, as EVGA keeps to a standard 250W TDP and uses a 7+2-phase power design on this model (FTW3 goes for 10+2). Core frequency is 1,556MHz base and 1,670MHz boost, though that is only marginally beaten by the more expensive FTW3. 11GB of GDDR5X memory, meanwhile, is kept at a stock 11Gbps. The cooler's extra lighting capability is reflected by having two power connectors - a standard four-pin and a special six-pin closest to the RGB side. Note that while others use a special copper insert or heatpipe-touching technology, EVGA's cooling is based on a large block and effective heat transfer. Dual-link DVI, triple DisplayPort and HDMI make up the output complement. There's no 'VR-specific' HDMI here, but we feel that feature is more a case of other companies jumping on the nascent VR bandwagon. 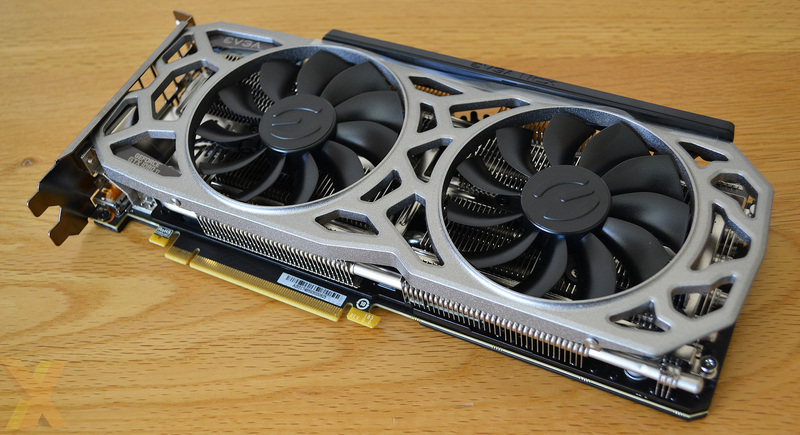 Functional and attractive, this here GTX 1080 Ti costs £750, putting it in the crosshairs of some very capable competition. Let's now see how it pans out.